Recent research has shown that Chile demonstrates the best price to network performance ratio of all countries across Latin America, with Entel leading average download speeds and WOM performing best for latency. Those results are based on our crowdsourced data, collected from 3.5 million speed tests taken between December and February. Across the country, Entel continues to perform best for download and upload speeds on 4G, averaging 15.14 Mbps and 8.69 Mbps respectively. 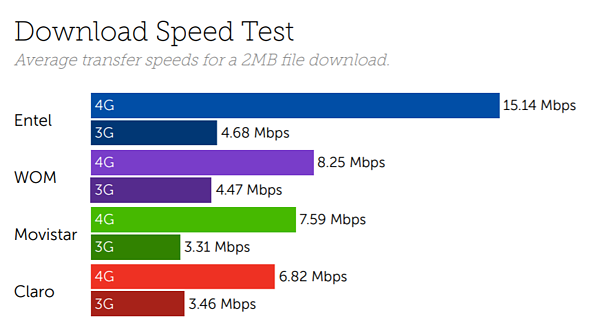 The gap between Entel and second place WOM is significant for download speeds, as WOM averages just 8.25 Mbps ahead of Movistar and Claro. Average results for upload speeds are closer, but follow the same pattern, as WOM placed second averaging 5.81 Mbps on 4G, followed by Movistar and Claro respectively. 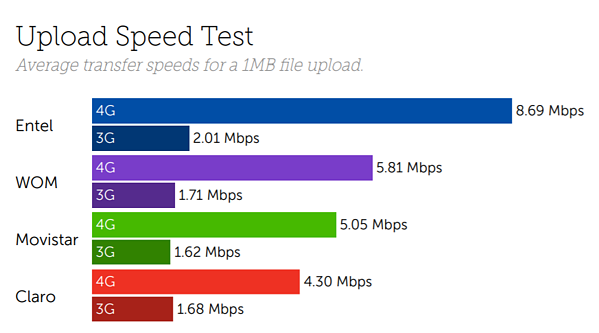 With an average latency on 4G of 41.0 ms, WOM inch ahead of Entel to top our rankings across the country. Entel place second averaging 41.1 ms, followed by Movistar and Claro. Claro’s latency has reduced significantly since our December Mobile Experience Report for the country, although it still sits significantly far behind, averaging a latency delay of 96.7 ms on 4G. The network stability results for operators across Chile are similar for the last three months compared with our December Mobile Experience Report, with Claro performing best for the lowest average packet loss but suffering from relatively high jitter. 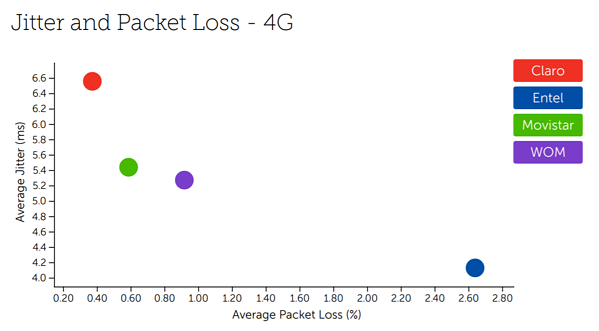 Conversely, Entel demonstrated the best average jitter, but were let down by their relatively high packet loss on 4G. Our findings for Chile are based on 30 billion network quality measurements including 3.51 million speed tests between December 2018 and February 2019. Our latest complimentary Mobile Experience Report is available to download from the Tutela Insights portal.